WoTC gave us a treat on Halloween by spoiling all five decklists for Commander 2014. It looks like the Red and White decks will be in scarce supply as they are the best out of the lot. Check out the full decklists as well as the current prices on our Commander 2014 page. 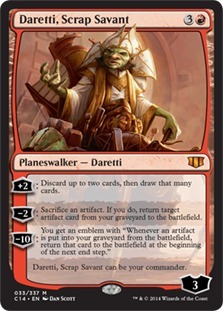 Be sure to also check out @SaffronOlive's great article on the financial implications of C14. 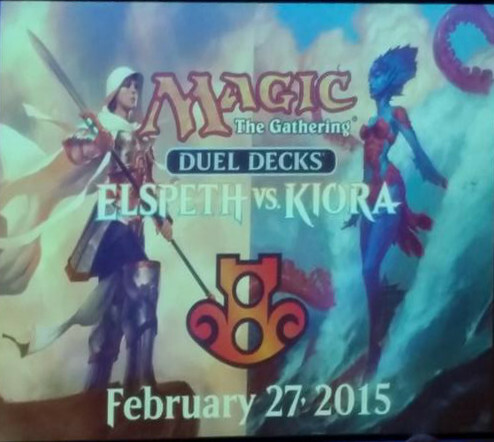 At PAX: AUS, WoTC announced the next Duel Deck: Elspeth vs Kiora. 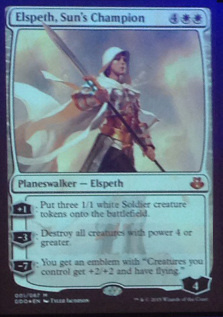 Alternate art for the two planeswalkers! Expect prices for both of the originals to come down. The new Duel Deck releases February 27, 2015. If you thought spoiler season was over, you were wrong! 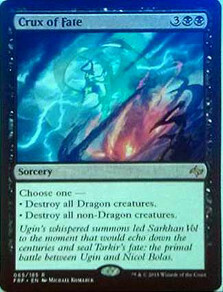 A sneak peek at some Fate Reforged cards couresty of WoTC at PAX: AUS. For the more serious grinders, WoTC announced a change in how Pro Points are awarded. tldr; you will be getting more than before. Read the full announcement here. Wizards announced a change to the MTGO Reimbursement Policy. Basically you will be reimbursed regardless of any prize you may or may not have won. This is great news and shows Wizards actually cares about its MTGO players! Read the full announcement here. We had a spicy brew take down SCG: Oakland yesterday. Ivan Jen piloted Jeskai Heroic Combo to a first place finish! Yes, another exciting Standard combo deck with Jeskai Ascendancy. Instead of being a pure Combo deck like earlier iterations of Standard Jeskai Combo, this deck plays aggressive Heroic creatures to put pressure on the opponent, and can kill them out of nowhere with the Ascendancy Combo utilizing Springleaf Drum and Akroan Crusader for infinite mana. 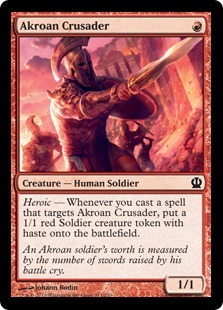 The way it works is as follows: First, you need Jeskai Ascendancy and Akroan Crusader in play. You cast Springleaf Drum and then Retraction Helix on Crusader getting a Soldier token. 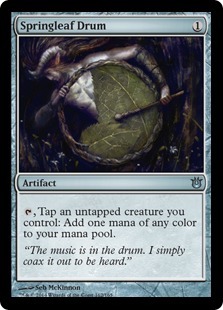 Use the Soldier Token with the Drum to generate mana, then bounce the Drum with the Crusader. Play the Drum and everything untaps and gets +1/+1. Repeat until you can kill your opponent. The beauty of this deck is it can easily win without comboing off. Just going to town with your creatures can get the job done like Boss Sligh or UW Heroic. Jeskai Ascendancy can be used as an Anthem-effect rather than a combo piece. This deck is quite efficient and looks very similar to Tempo Twin in Modern in terms of style. Win a Funko Series 2 Figure! 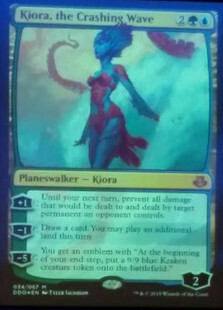 We're trying something new and running a contest here at MTGGoldfish. Enter (for FREE) and win your choice of a Funko Pop Series 2 figure when they release! See details and enter here. 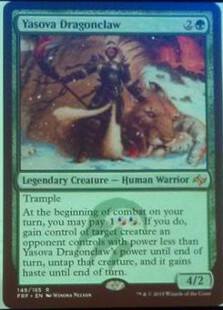 Commander 2014 is set to release on November 7, 2014. 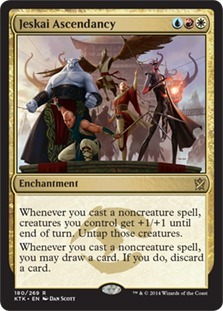 Be the first to play with the new Commander-Planeswalkers! Pre-orders are still available on ebay for ~$150, which is $25 off of MSRP! Not expecting this email? Unsubscribe here.